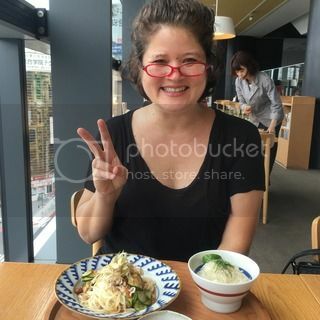 For lunch I got together with my friend, Yukari, who is a book author and also runs a great blog about Tokyo gourmet scene called Food Sake Tokyo. 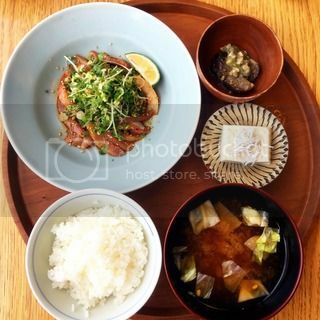 We got a great view from Shibuya Hikarie's 11th floor restaurant, D47 Shokudo. It was so good to see her again! In the evening, I was invited to a special party. It was to celebrate my mentor, Saito-san's great achievements in the music industry. He was the very person who hired me at Toshiba-EMI almost 20 years ago, when he was the chief manager in the International Music Division there. Then, he became the president of the company and stayed there for more than 10 years until he moved to Victor to become the president there. This year, he was honored with Ranju Hosho (the medal with Blue Ribbon by the Japanese government for his outstanding contribution in the Japanese music industry. 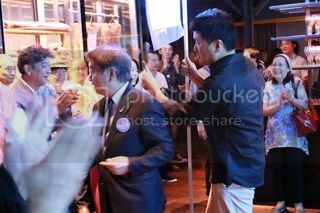 Those selected people who have had close relationship with Saito-san from former EMI and Victor were invited to the party. The party was so much fun, as it turned out to be a special reunion with my former colleagues at Toshiba-EMI. 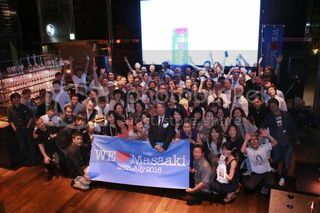 We were so happy to see each other and also to celebrate Saito-san's achievement together.